I love crochet and I most definitely love beaded crochet. This jewelry set is an extension of that love - to include gemstones, sequins, Swarovski Elements. Need color in your life? 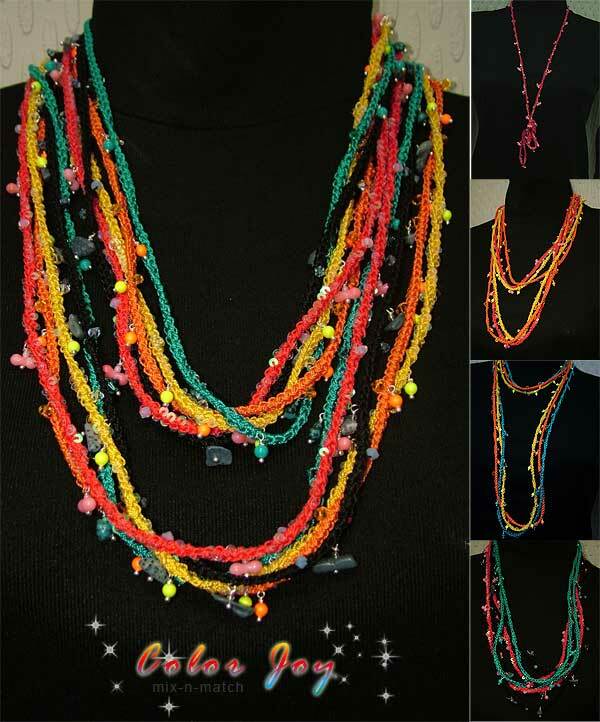 The new Swarovski Neon Pearls are a delightful source of inspiration in this Color Joy crochet jewelry set. I have been feeling a need for bright colors in my life lately. And as it so happened, my new stash of Swarovski Neon Pearls kept calling to me. Most insistently. So I went for it! 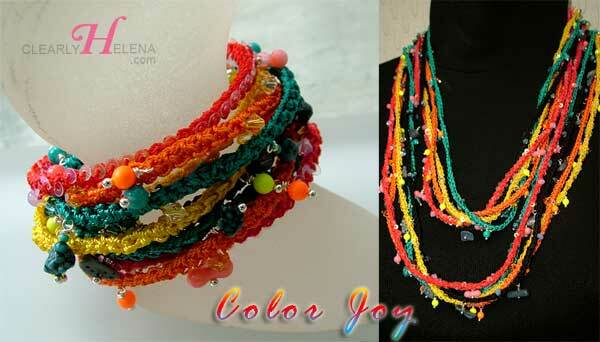 This full set comprises crochet bangles and necklaces - in bright matching colors. They are a big extension to the jewelry wardrobe and the colors can be easily mixed and matched. Knowing me (as I do! 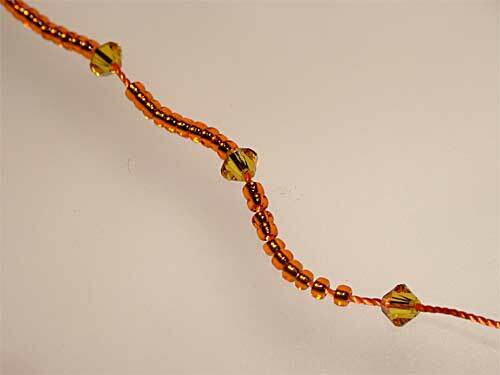 ), it is nigh impossible for me to just make jewelry without the joys and delights of beads. So in this set, I have incorporated Swarovski beads, gemstones, and even tiny sequins. 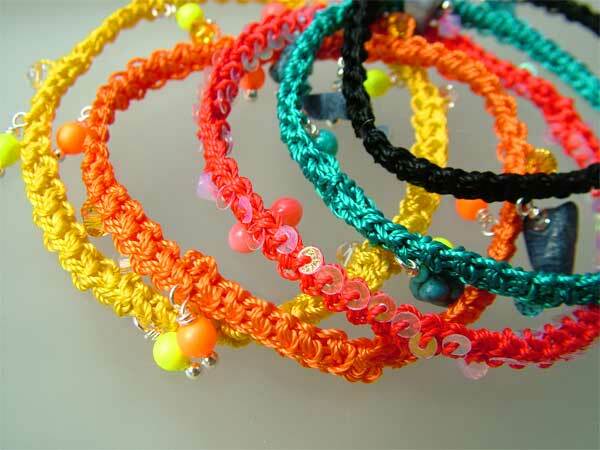 The crochet bangles can be worn individually or in any combination that you desire. They are fuss-free - just roll on and you are ready to colourfully dazzle! Because they are soft and flexible, they won't crack as with rigid bangles should you accidentally hit your wrist against a table. 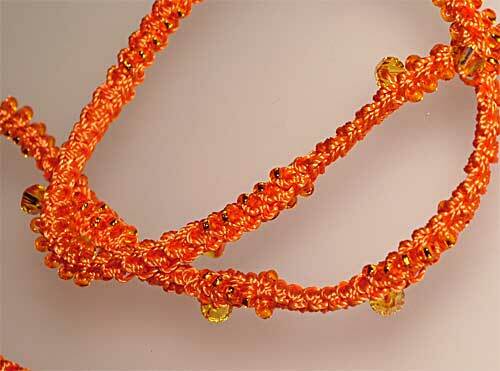 These beaded crochet necklaces are made in the same way. 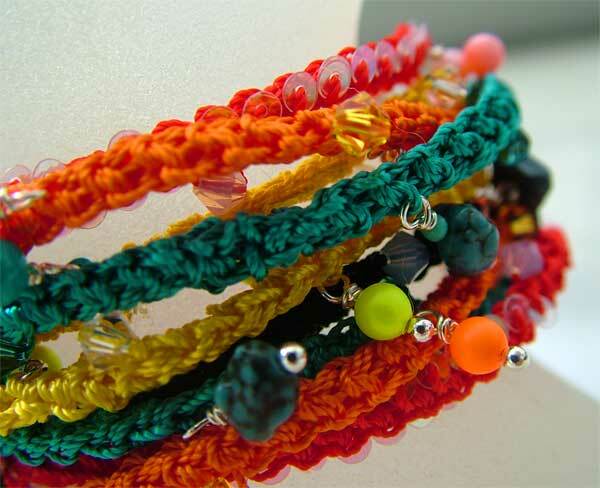 They are extra long so that you can achieve a variety of styles with them (knotted, double looped, etc.) They are designed for mix-and-match colors as well. So easy to wear - no fussing with clasps and what nots! For this particular set, I have employed the Duo Sided Crochet cord technique. (For your convenience, clicking on the link will open a new window). 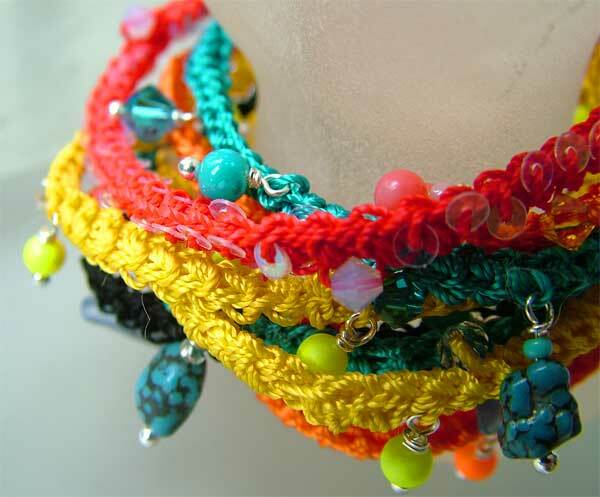 If you are going to incorporate beads, sequins, and/or dangles into your crochet ropes, the first step is the preparation. 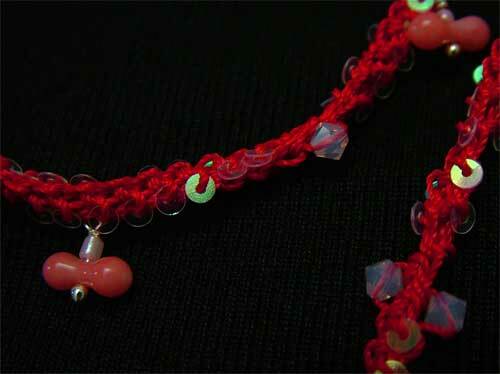 If there are no dangles to be made, just string on the required beads and sequins (as shown below). I am just stringing them on randomly - i.e. no precise number of any of the elements to be incorporated. Make sure you string more than enough so you won't have to break off in the middle of work to string on more. The following shows how it looks beaded up. Here is a close up of one crochet rope, crocheted with dangles, beads, and sequins. First, make up the dangles. 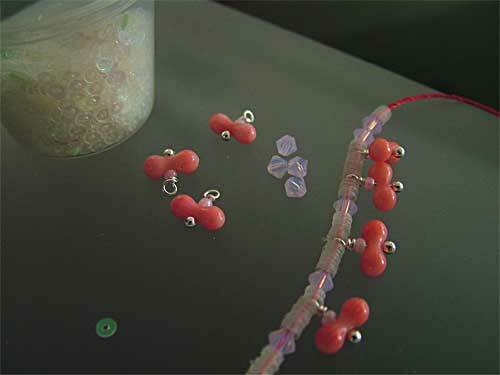 Here I have used dog-bone coral beads and round top head pins; making wire secure wire loops. Then randomly string up the sequins, beads, and dangles. And this is what it looks like when the crochet rope is done. To join the crochet rope, just securing sew end to end together - as much as possible, making sure there is no undesired twists in the rope and that you match the stitches as closely as possible so that the whole crochet rope joins seamless and strongly. In this set, I have used my very favourite viscose yarn, which is about a ply 2 or 3 thickness. It is very strong, has great sheen, and just delightful to work with. But because it does have have such beautiful sheen, it also tends to be "slidy". To make sure that the joined ends do not come apart over time, I have not only woven the thread ends multiple times, but before snipping off, I have employed fabric (washable) glue (Allens) to ensure there will be no unraveling. I shall end off by showing some detailed shots of the finished bangles where you can see the pattern of the Duo Sided Crochet Rope as well as the beads and gemstones that have been crocheted into them. Note how bright and delicious the colours are. Aaah, thank you Swarovski for the latest innovative release of the 2012 Swarovski Neon Pearls! If you are interest in finding more designs for making jewelry with crochet, you will appreciate the wide and wonderfully creative offerings and designs in the many books available. Definitely worth a browse!